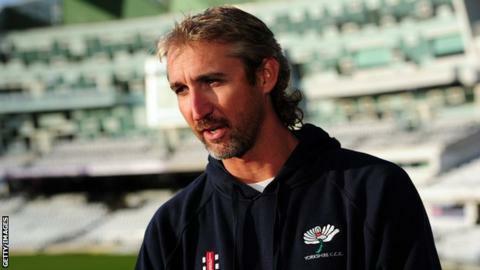 Former Australia fast bowler Jason Gillespie has called for Ireland to be elevated to Test-cricket status. Gillespie, now head coach of Yorkshire, believes the move would reward Ireland's performances in limited-overs internationals and provide a necessary boost to the five-day format. "One fantastic way to give Test cricket a lift straight away would be to give Ireland Test status," said Gillespie. "It is something that should happen sooner rather than later from the ICC." "Let's face it, outside of Australia and England and, to a lesser extent, South Africa, people don't turn up to watch Test cricket. That's just the way it is, and it's sad," the 39-year-old told All Out Cricket. "Imagine if Ireland were given Test status. That would be huge news in world cricket, and it would be a massive positive story for the world game. "The ICC and all the national boards talk a lot about the importance of protecting the integrity of Test cricket. If it is that important, then we should look to improve it, and in my view including Ireland would improve it." Ireland reached the Super Eight stage of the 2007 World Cup, beating Pakistan and Bangladesh, and claimed a memorable victory over England at the 2011 tournament. In addition, they have played in every World Twenty20 since 2009. "Ireland are ticking all the boxes. They've punched well above their weight in limited-overs tournaments," added Gillespie. "Think of the list of names who've plied their trade in English domestic cricket and who have even played for England. It would make a decent Test side. "I don't see why it couldn't happen. Eoin Morgan is obviously with England full-time now but, apart from him, you've got Ed Joyce (Sussex), William Porterfield, Boyd Rankin (both Warwickshire), George Dockrell (Somerset), Peter Chase (Durham)." Surrey captain Gary Wilson, Middlesex opener Paul Stirling and brothers Niall and Kevin O'Brien are also among the Irish contingent to make their way in the county game. A play-off system that will give Ireland and Scotland the chance to play Test cricket was approved by the International Cricket Council in April.